Plants have been used to relieve the diseases of humanity ever since remote times. Empirical knowledge about medicinal plants and their healing effects has existed for thousands of years, and later became an integral part of healing systems and traditions. During the last century, the drive of the pharmaceutical industry made the therapeutics found using plants to be regarded as a “primitive” and irrational practice, in recent decades phytotherapy (the science that studies the use of plants with therapeutic purposes) has experienced an extraordinary resurgence. 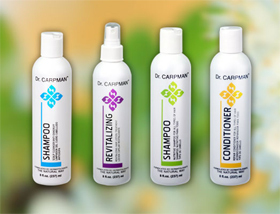 Dr. Carpman has created these unique formulations that achieve proven extraordinary results. 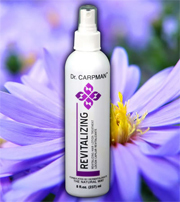 Dr. Carpman's Revitalizing Lotion contributes to healthy hair growth. As a result of an extensive investigation of the effects of thousands of herbs , Dr. Carpman formulates this unique combination that achieves a powerful preventive effect for alopecia (hair loss). It is also an excellent treatment for severe dermatitis, including psoriasis. This product can be used at any time, without limitations of age or gender. It is efficacy in its purest state. 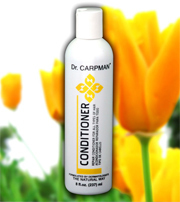 Dr. Carpman's Revitalizing Conditioner was formulated for any type of hair, combining plant products that condition and revitalize. It cleanes, and provides shine, and protection against environmental factors that are aggressive to hair, such as pollution and extreme weather conditions. 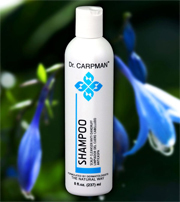 Dr. Carpman's Cleansing Shampoo was formulated by selecting herbs that are non-aggressive, and control dandruff and sebum excess. This exclusive formula prepares the scalp for the combined action of Dr. Carpman's conditioner and Revitalizing Hair Lotion. The perfect solution for comprehensive health for your hair. 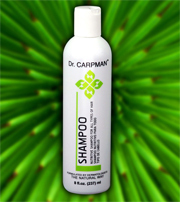 Dr. Carpman's Nourishing Shampoo, especially formulated to nourish and strengthen hair, returns hair's strength and increases its shine. As a result of a unique combination of carefully selected and mixed medicinal plants, it contributes to quicken hair growth, giving it a healthy and beautiful appearance. The prolonged tradition of using herbal medicine in medicine and the contemporary reaction against synthetic drugs has led to a resurgence of herbalism, at times called phytotherapy. “Natural medicine” has gotten an aura of undeserved healthiness; in fact, the compounds used by herbalists are often the same in industrial drugs, only that they are mixed, and in a dose that is much less accurate. The secondary effects caused by industrial drugs less frequent in herbal medicine, and the risk of adverse reactions or confusions in their use is also present. Phytotherapy practiced currently, incorporates both the Western herbalist tradition - that goes back to Ancient Greeks and Romans, and Hindu Ayurveda tradition and Chinese phytotherapy. A medicinal plant is a plant which can be used to relieve or cure medical problems. Parts of the plant can be used, or extracts can be processed to use as treatments for various medical conditions. The plant used medicinally is known as a botanical drug, and it can be administered in different ways.